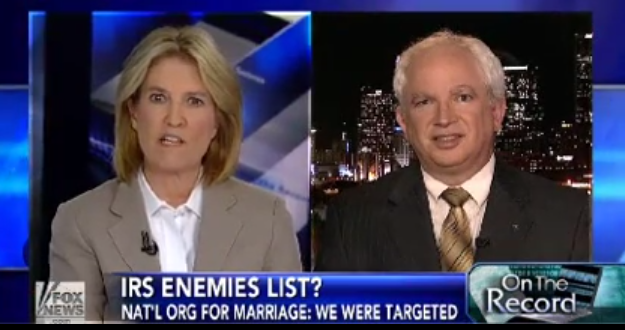 For two years, the National Organization for Marriage (NOM) has been peddling the theory that the IRS intentionally leaked its donor list to a gay rights organization as part of an Obama administration conspiracy. Two separate investigations and a ruling by a Reagan-appointed judge have debunked that theory. But right-wing media, which have widely touted NOM's initial accusations, have largely ignored or denied the conspiracy theory's demise. In the spring of 2012, an IRS employee inadvertently leaked an unredacted list of NOM's donors in response to a public records request. The pro-equality group Human Rights Campaign (HRC) got its hands on the list, highlighting  past contributions to NOM by prominent conservatives like then-presidential candidate Mitt Romney. Noting that key HRC officials were prominent supporters of President Obama's re-election campaign, NOM alleged a conspiracy  between the organization and the Obama administration aimed at embarrassing NOM and its supporters. In April 2012, NOM filed a formal letter of complaint to the IRS. Conservative outlets like The Daily Caller  and The Weekly Standard  touted the complaint, focusing particularly on the revelation that Romney was one of the group's donors. For most of the next year, however, media interest in the story was scant. That changed in the spring of 2013. In May, U.S. Attorney General Eric holder ordered the FBI to begin a criminal probe  into allegations that the agency had targeted tax-exempt conservative political groups. 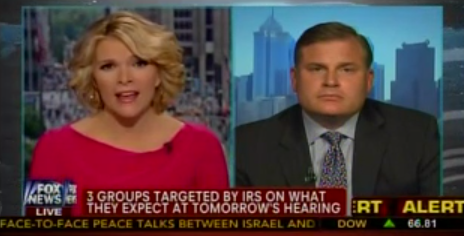 While the IRS actually scrutinized progressive groups more extensively  than conservative ones, the IRS "scandal" became a rallying cry for right-wing media . The controversy also meant newfound interest in NOM's allegations against the agency. Mainstream and conservative media outlets were quick to pick up on NOM's call for an investigation into the IRS's activities. Breitbart.com listed  NOM's allegations as one of the top 10 questions "Obama must answer on IRS scandal," while National Review Online amplified NOM's conspiracy theory , declaring that "[i]t's not paranoia when they're really out to get you." Investigations into the matter, however, revealed the flimsiness of NOM's accusations. 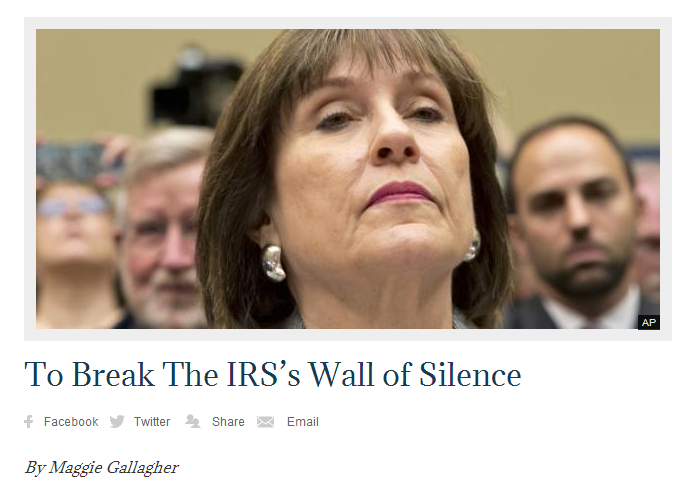 By the summer of 2013, the IRS's acting commissioner and the Treasury Department's inspector general for tax administration had already conducted inquiries into NOM's allegation, turning up no evidence  that the Obama administration had colluded with the HRC to engineer the leak of NOM's donor list and finding that the leak was the mistake of a low-level employee - a point that even NOM co-founder Maggie Gallagher seemed to acknowledge . That didn't stop NOM from suing the IRS for damages  last fall. In essence, NOM asks the Court to infer that Peters lacked authority based on the absence of a complete audit trail regarding her actions and the specifics of Meisel's request. This argument is unpersuasive. No reasonable jury could find in NOM's favor based solely on this negative inference when the remaining evidence overwhelmingly indicates that Peters inspected the return while performing her official IRS duties. To find that NOM could prevail from this scintilla of evidence would require "the building of one inference upon another," which is not appropriate under Rule 56. While rejecting NOM's theory that its donor list was intentionally leaked, Cacheris did allow NOM to proceed with its claims for legal fees and any proven damages resulting from the unintentional leak. That was enough for NOM - ignoring the awkward fact that Cacheris had smacked down its central claims - to declare victory . The conservative media followed suit. Nearly two weeks after Cacheris' ruling, Fox News' Shannon Bream hosted Eastman  to discuss NOM's bid for damages - neglecting to mention the ruling itself, which was the very reason NOM's claims could proceed. While both websites raised the red herring of former HRC president Joe Solmonese's support for President Obama's re-election, neither noted that Cacheris and investigators have consistently determined the leak of NOM's donor information to have been unintentional. It remains to be seen whether other conservative outlets will adopt the blatantly misleading narrative that the IRS's agreement amounts to an admission of "guilt." Many of the outlets that touted NOM's conspiracy campaign were silent in the aftermath of Cacheris' ruling - perhaps another indicator that NOM and its larger cause are rapidly running out of gas . With the conservative media hell-bent on proving a nefarious IRS conspiracy against conservative groups, however, it remains possible that even NOM's thoroughly debunked claims will continue to provide them fodder.